The question of why ice ages occur is extremely complex and continues to be a primary area of research by climate scientists in a variety of disciplines. Researchers have identified several different processes that contribute to global climate change on drastically different time scales - from decades to millions of years - and both the individual processes and their intersection at varying time scales appear to influence when and how climate changes, as well as the rate at which it changes. Processes that occur over very long time scales, such as the movement of continents around the earth's surface as well as continental uplift and mountain building, seem to correlate with the long-term shifts between "hot house" and "ice age" global climates. These shifts occur over tens, or even hundreds, of millions of years. Relatively shorter-scale fluctuations in the Earth's orbit around the sun, as well as shifts in atmospheric and ocean circulation patterns, fluctuations in the amount of atmospheric carbon dioxide, and even the occurrence of large volcanic eruptions also impact global climate patterns and contribute to rapid changes, on the order of hundreds to thousands of years, between warm and cold climates. The intersection of these many processes has resulted in a rather complex global climate history that is still being unraveled. Over the course of the 20th century, scientists discovered that the surface of the earth (the crust) is not a single hard layer, like the outside of a ball, but instead consists of several large pieces, called tectonic plates (the lithosphere), that float on top of a semi-solid layer of molten rock (the asthenosphere) and move around the planet. Plates may contain oceanic crust (the land under the oceans) or continental crust (the landmass that forms the continents), and most current plates contain both. They move very slowly, on the order of centimeters each year, but continuously, leading to an ever-changing configuration of continents and oceans. Furthermore, the plates move at different rates, and they pull away from each other (divergent boundary), slide under/over, or crash into, each other (convergent boundary), or slide past each other (transform boundary), all of which changes their size and shapes. Plates that pull away from each other allow new land to form in the rift, or giant crack, that separates them; currently this occurs in the middle of the Atlantic ocean where the North American and African plates are slowly moving away from each other in a process that began roughly 175 million years ago, creating new oceanic crust. On the other hand, when plates collide with each other (at the relatively fast rate of several meters per century), one plate may be forced below the other, where it is melted and recycled into new crust-forming materials. This typically occurs when an ocean plate is forced below a continental plate, and it results in the uplift of the continental plate and formation of mountains and increased volcanic activity. A modern example is the subduction of the Nazca plate (Pacific Ocean) below the South American plate, which has created the Andes mountains. When two continents collide at a convergent boundary, neither is forced below the other, and instead the landmasses are smashed together and pushed upwards, similar to squeezing two pieces of clay together. This can create massive new mountains and uplifted landforms, such as the Himalaya Mountains, which began forming roughly 50 million years ago when the Indian plate began colliding with the Eurasian plate. All of these changes in the structure of the Earth's surface take place over millions of years, but they can have significant and long-lasting impacts on our planet's climate. The position of the continents with respect to the poles is probably one of the most important factors controlling the long-term fluctuations in global climate. It is thought that the movement of the North American and, eventually, the Eurasian plates towards the north pole contributed significantly to the initiation of the long global cooling period that triggered the onset of the current ice age roughly three million years ago. The presence of large land masses at high latitudes appears to be a prerequisite for the development of extensive ice sheets, because the large accumulations of ice associated with ice sheets cannot form over the ocean. At the start of the present ice age, not only were North America and Europe located in the higher latitudes near the north pole, but Antarctica was located at the south pole. This continental configuration led to extensive glaciation of both North America and Eurasia, as well as full continental ice sheets covering Antarctica. During the ice age that occurred in the Pennsylvanian and Permian (roughly 300 million years ago), the southern portion of the supercontinent Pangea was at the south pole. The result was extensive glaciation of what is now Africa, South America, India, Antarctica, Australia, and the Arabian peninsula. The position of the continents during the Cryogenian glaciation (around 700 million years ago) is not well-known, although it is thought that large portions of the supercontinent, Rodinia, may have been covered by the southern polar ice cap. The distribution of continents around the planet also impacts oceanic circulation patterns, which can greatly affect the global climate system. The oceans are a major heat sink in the global climate system because they absorb large amounts of incoming solar radiation, and oceanic circulation is a primary mechanism for transferring this heat from the equator, where it is abundant, to the poles, where it is more scarce. The ability of the ocean to transport heat to the higher latitiudes (the poles) depends largely on whether there are open pathways for the water to move through. As continental land masses move away from each other, a gateway may be opened that allows ocean water to move into or through new areas, allowing warmer and cooler water to mix and, thus, transporting heat towards or away from land masses. An important example of this is the development of the circum-Antarctic seaway over the course of the Eocene (~ 55-34 million years ago) and the Oligocene (~34-22 million years ago), which isolated the Antarctic continent and allowed increasingly cold waters to circulate through the southern oceans. This seaway began to form when the Australian continent separated from Antarctica and drifted northward in the early Eocene, creating a new ocean, but a thinned and broken area of continental crust (the South Tasman Plateau) was left between the two continents that essentially blocked deep ocean circulation. It did not develop into an open seaway around Antarctica until the South Tasman Plateau fully separated from Antarctica (~ 32-30 million years ago), allowing deep ocean waters to flow between the continents, and Drake Passage opened between the southern tip of South America and Antarctica (~32-30 million years ago), creating an unrestricted deep passageway for cold ocean water to flow around Antarctica and providing a means for the mingling and exchange of water between major global oceans. Likewise, when land masses collide or new land is uplifted, an existing gateway may be closed, thereby restricting the flow of ocean water and the exchange of heat from one area to another. The latter occurred most recently when the development of the Isthmus of Panama roughly 5 million years ago created a continuous land bridge between North and South America, closing off the Central American Seaway that had connected the Pacific and Atlantic oceans. Before the creation of this landbridge, surface waters were able to flow from the Pacific to the Atlantic, intermixing the two bodies of water and balancing their salinity. Once the gateway closed, this exchange stopped and the salinity between the two bodies of water changed. As water evaporated from the tropical Atlantic, it left the ocean waters saltier, and the evaporated fresh water vapor was carried by trade winds to the west, where it was deposited as rainfall into the Pacific ocean and reduced the salinity of that ocean. The physical barrier between the two oceans intensified the Gulf Stream, which drew the warm, and now much saltier, waters of the tropical Atlantic northwards to the North Atlantic, bringing warmth and moisture to the higher latitudes. The absorption of this increased heat and moisture by the atmosphere left cold, dense, salty water to sink to bottom of the ocean, where it flowed back to the Southern Ocean and eventually into the Indian and Pacific oceans, before mixing with warmer waters and returning to the tropical Atlantic. It is thought that the increased moisture in the northern atmosphere led to increased rain and snow on the northern continents, and eventually resulted in more fresh water in the Arctic ocean that could be used for the formation of sea ice. Both the formation of sea ice and the increased amount of fresh cool water flowing back into the North Atlantic would have helped to counteract the effects of the heat transported by the Gulf Stream, setting up conditions for Arctic cooling and ice sheet growth. It is very likely that these conditions contributed to the onset of northern hemisphere glaciation at roughly 2.7 million years ago and the start of the current Ice Age. Some scientists hypothesize that climatic changes caused by tectonic uplift are critical to the development of ice ages. Plate movements cause uplift of large continental blocks when one plate moves up over another at a convergent boundary, or when two plates collide and push upwards. Typically, mountain ranges form along this convergent boundary, and in extreme cases, large continental blocks are uplifted to form broad plateaus around the mountain ranges. For instance, the collision of the Indian and Eurasian Plates during the middle Cenozoic resulted in the uplift of the Tibetan Plateau and Himalaya Mountains. These uplifted land masses can affect the regional and global climates in several ways. First, mountain ranges present physical obstacles to existing atmospheric circulation patterns, forcing air flow to move up and/or around them, increasing wind velocities and creating wind eddies. At the regional scale, mountains impact precipitation patterns by increasing the amount of precipation on the windward side (the side the winds are flowing from) and creating a rain-shadow effect (decreased rainfall and much drier conditions) on the leeward side of the mountains. Second, the cooler temperatures, and often wetter conditions, found in the higher altitudes of mountainous areas provide favorable conditions for the development of alpine glaciers and ice sheets. This, in turn, can induce the ice-albedo feedback mechanism (see below), in which larger amounts of incoming solar radiation are reflected back into space, leading to lower temperatures and increased snow and ice. Third, the process of tectonic uplift and the creation of mountainous areas exposes fresh silicate bedrock surfaces to weathering, a process that breaks down the rock into physically smaller pieces and/or chemically alters the minerals in a rock to form new minerals. Chemical weathering of silicate rocks occurs when atmospheric carbon dioxide (CO2) combines with rain water to form carbonic acid, and the acid reacts with the silicates to create new minerals. The dissolved atmospheric carbon is then transported by rivers into the oceans, where it is trapped in deep ocean waters for thousands of years or stored in marine sediments or corals for even longer periods of time. This process removes large amounts of atmopheric CO2, effectively reducing the overall concentrations of this greenhouse gas in the atmosphere. A general reduction in the amount of carbon dioxide CO2 in the atmosphere may contribute to the development of ice ages by lowering global temperatures, although it is unlikely that CO2 concentrations alone could actually trigger an ice age. Although scientists still debate the role that the Himalayan uplift played in the onset of the late Cenozoic Ice Age, most researchers agree that this major event contributed in some way to the inititaion of the current cool period. In combination these factors influence the amount and distribution of solar radiation reaching the Earth (insolation). Because of the different periodicities of variation for the three factors, the composite variations in solar radiation are very complex. This graph shows the incoming solar radiation over the last 600,000 years for summer at 65 degrees north latitude. Note the complex changes that occur in the curve. The curve was derived using the changing values of the eccentricity of the orbit, tilt of the axis and precession of the equinoxes. Although the connections are not obvious and direct, changes in the amount of solar radiation are thought to drive the growth and melting of major ice sheets. Over the last 750,000 years ice sheets have expanded into the midwestern United States at least eight major times. The Earth's orbit around the sun is not a circle, but rather it is an ellipse. The shape of the elliptical orbit, which is measured by its eccentricity, varies from between one and five percent through time. The eccentricity affects the difference in the amounts of radiation the Earth's surface receives at aphelion, the point on its orbit at which the Earth is furthest from the sun, and at perihelion, the point on its orbit at which the Earth is closest to the sun. The effect of the radiation variation is to change the seasonal contrast in the northern and southern hemispheres. For example, when the orbit is highly elliptical, one hemisphere will have hot summers and cold winters; the other hemisphere will have warm summers and cool winters. When the orbit is nearly circular, both hemispheres will have similar seasonal contrasts in temperature. Although the amount of change in radiation is very small (less than 0.2%), it is apparently extremely important in the expansion and melting of ice sheets. 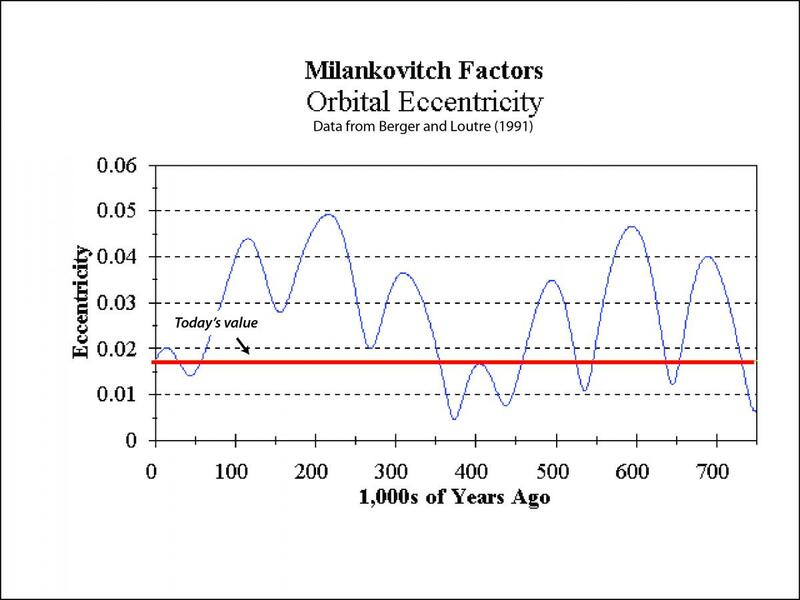 The eccentricity of the Earth's orbit varies in a periodic manner. The primary periodicity is approximately 100,000 years. The Earth's axis is tilted with respect to its orbit around the sun. Today the tilt is approximately 23.5 degrees. The tilt varies from between 21.6 and 24.5 degrees in a periodic manner. 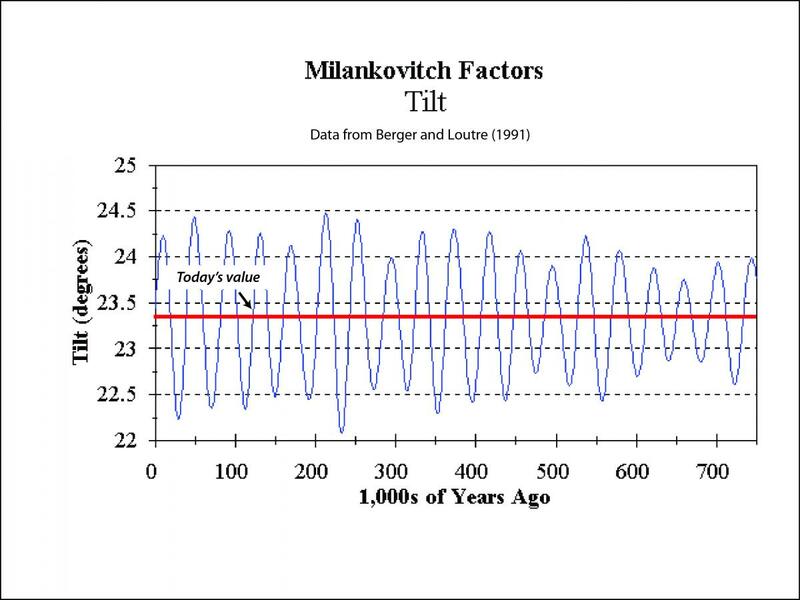 A graph of the tilt over the last 750,000 years shows that the dominant period of this variation is approximately 41,000 years. Changes in the tilt of the Earth's axis cause large changes in the seasonal distribution of radiation at high latitudes and in the length of the winter dark period at the poles. Changes in tilt have very little effect on low latitudes. The effects of tilt on the amount of solar radiation reaching the Earth are closely linked to the effects of precession. Variation in these two factors cause radiation changes of up to 15% at high latitudes. Radiation variation of this magnitude greatly influences the growth and melting of ice sheets. Twice a year, the equinoxes, the sun is positioned directly over the equator. Currently the equinoxes occur on approximately March 21 and September 21. However, because the Earth's axis of rotation "wobbles" (like a spinning top), the timing of the equinoxes changes . The change in the timing of the equinoxes is known as precession. Although the timing of the equinoxes is not in itself important in determining climate, the timing of the Earth's aphelion and perihelion also changes. Like the timing of the equinoxes, the timing of the aphelion and perihelion is also affected by the wobble of the axis of rotation. The changing aphelion and perihelion is important for climate because it affects the seasonal balance of radiation. For example, when perihelion falls in January the northern hemisphere winter and southern hemisphere summer are slightly warmer than the corresponding seasons in the opposite hemispheres. 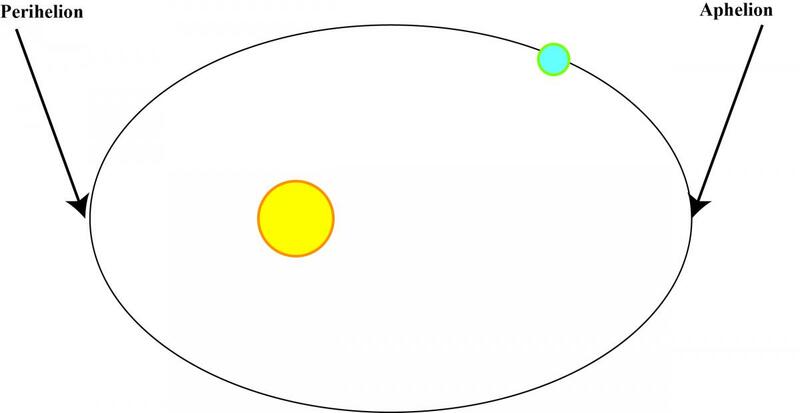 The aphelion and perihelion change position on the orbit through a cycle of 360 degrees. The cycle has two periods of approximately 19,000 and 23,000 years. Together these combine to produce a generalized periodicity of about 22,000 years. 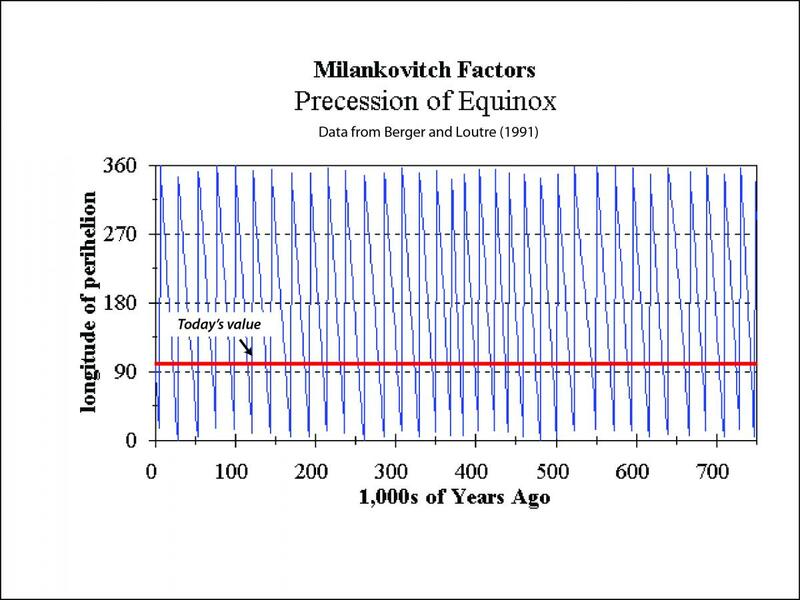 The graph to the right illustrates the precession of the equinox over the last 750,000 years. The precession is expressed as the longitude of the perihelion from the vernal equinox. The blue line traces the precession; the red line shows today's value for comparison. The effects of precession on the amount of solar radiation reaching the Earth are closely linked to the effects of tilt. Variation in these two factors cause radiation changes of up to 15% at high latitudes. Radiation variation of this magnitude greatly influences the growth and melting of ice sheets. As the global climate changes, towards warming or cooling, various responses within the system may act to either strengthen or weaken the direction of change by affecting the processes driving that change. When a response works to amplify disturbances to the climate system, increasing the destabilization of the prevailing climate, it is called a positive feedback mechanism. Negative feedback mechanisms work to dampen the effects of a disturbance and provide a stabilizing influence on the larger system. For instance, as ice sheets start to form within a cooling global climate they increase the amount of solar radiation (insolation) that is reflected back into space (albedo), rather than absorbed by the soil and vegetation, resulting in lower temperatures and more favorable conditions for continued ice sheet growth. Thus, the very formation of ice sheets during a shift towards a cooler climate sets up a positive feedback mechanism for the continued global change to an Icehouse climate. The growth of ice sheets may not have caused the initial change towards a cooler climate, but they support and amplify that change. Likewise, as global temperatures increase, and ice sheets melt, the Earth's surface albedo (reflectivity) is reduced, allowing more insolation to be absorbed by the soil, vegetation, and oceans. This in turn warms the Earth's surface, which leads to more melting, and so on, in a self-reinforcing cycle. In both cases, changes in surface albedo serve to amplify changes in the system, setting up a positive feedback loop for the prevailing direction of climate change. Similarly, atmospheric water vapor acts as a positive-feedback amplifier for the climate change induced by other greenhouse gases, such as CO2 and methane. As the atmosphere warms, more surface water is evaporated and the amount of water vapor in the atmosphere increases. The increased atmospheric water vapor then absorbs more thermal infrared heat reflected from the earth, which in turn further warms the atmosphere and increases evaporation rates. Fortunately, negative feedbacks exist to keep this process from becoming a run-away cycle. For instance, increased atmospheric water vapor leads to increased cloud formation, which helps to reduce global temperatures by reflecting more incoming solar radiation before it reaches the surface. In contrast, chemical weathering tends to act as a weak negative feedback mechanism on the global climate system. As discussed above, chemical weathering occurs when atmospheric carbon dioxide dissolves in rainwater to form a weak acid, and this acid breaks down exposed rock surfaces into chemical ions that are transported to the ocean through groundwater and surface runoff. Weathering of silicate rocks in this fashion creates bicarbonate ions (HCO3-) that are eventually incorporated into calcite (marine shells) and stored more permanently in marine sediments and carbonate rocks (e.g., limestone). In this way, chemical weathering of silicate rocks acts as an atmospheric carbon sink, because it pulls carbon from the atmosphere and converts it through chemical reactions into a form that can be locked away for thousands of years or longer. Chemical weathering has a negative feedback effect on global climate systems because the rates of weathering are temperature dependent. As global temperatures rise, more weathering occurs, leading to lower amounts of atmospheric carbon and decreased atmospheric temperatures, and subsequently lower rates of weathering. Utah Geological Survey - Ice Ages: What are they and what causes them? William W. Hay · Emanuel Soeding, Robert M. DeConto · Christopher N. Wold. 2002. The Late Cenozoic uplift – climate change paradox. International Journal of Earth Science 91:746–774.